Wanna meet our new baby? First meeting off the transport. Her name is Bella. We picked her up this week! And we're just loving her. A lavender field in full bloom creates a purple and green landscape and infuses a sweet fragrance into the air. A field of flowers brought to life with the buzzing of bees, decorated with birds and butterflies drawn to its fragrant aroma. The lavender fragrance wafts gently through the air, carrying the memories of flowers, happiness, and sunny days. Far away, a summer porch, framed by windows with white lace, is surrounded with the scent of lavender. Lavender blooming in window boxes and flower pots, or decorating a flower garden with their purple blossoms. Whether along a country road or on a city street, the lavender scent embraces all indiscriminately. Too beautiful to remain outdoors, the fragrance of lavender easily enters our homes and daily lives. From a carefully tended flowerbed we pick a tiny bunch and place it in a hand-cut crystal bud vase, where it can brighten a corner as it sits upon a vintage lace doily. Tuck a sprig of the tiny flowers into the lace band of a broad-brimmed summer hat, carrying the beautiful fragrance with us wherever we go. Or perhaps lay it inside a dresser drawer. Tie it with a tiny scrap of lace and hang it upon a wall, set it upon a shelf. In a drawer or as a lavender bouquet tied with apple-green organdy ribbon, edged with a dainty row of lace, the loveliness of lavender is impossible to contain. An elegant centerpiece set upon an antique table draped with a vintage lace table cloth, it's a feast for more than the eyes as the fragrant aroma declares its presence. Sunlight shining through the lacy curtains warms the room and casts delicate shadows upon the wall. Suddenly, the room seems draped in a lavender landscape and fields of lace. Click HERE to see the participating boutiques. 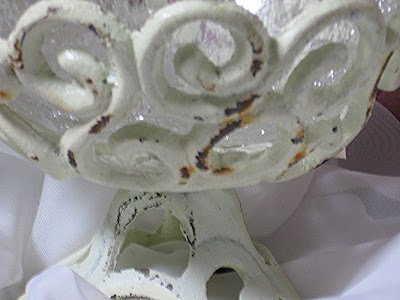 Click HERE to see Hydrangea Home's "lavender and lace" products. First let me introduce you to the non-profit organization that Make Mine Pink is joining hands with this year. 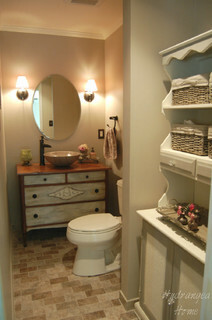 I'm sure you've heard of Terry Grahl of Enchanted Makeovers? Well, for the past several years Terry has been donating her time and gathering resources to refurbish women and children's shelters. This year the 2009 Vision project is Terry's shelter makeover. We're proud to be able to help her with this worthy project. Part of Terry's plan is to have a hope chest for each girl in the shelter that would be filled with items that they will need when they move on from the shelter. We all had or knew someone that had a hope chest, and understand the significance of giving these girls something to look forward to..dream about.. hope for. Terry had a company lined up that expressed interest in providing the hope chest for all 20 girls but unfortunately the company that was planning to donate the hope chests is no longer able to. Terry has asked MMP to help. Two hope chests have already been donated, leaving 18 for MMP to raise funds for. As I doodled 18 hope chest at 200.00 each = 3600.00 on a piece of paper, I started thinking. 18 people (only 18) could adopt/provide a hope chest for 200.00 contribution. Two Hundred dollars each didn't sound all that bad. I could do that for such a worthy cause. But I doodled some more and thought.. 36 people - 2 to a chest would be 100.00 each - that was even better! But what about teams of 3 people? That would be 67 dollars each? That would be so within many of our reach, making it easier for more to participate. I just knew we could do this if we formed teams to adopt a hope chest. Suddenly the plan for 18 hope chests and 3600.00 didn't seem out of reach at all. A plan was formed and the adopt a hope chest program began. Some of you asked if the hope chest will go with each girl. No.. it will stay at the shelter offering hopes and dreams to every new resident. When one graduates, she'll take with her the contents (some of which we will contribute) and make room for a new resident to plan and dream of a time when she'll be ready to move on. Terry has a gentleman that will be constructing each hope chest.. so time is not a luxury we have. The 2009 vision project is due to be completed by August, so we need to move fast! Monetary donations for the hope chests will be due by May 30th. On behalf of Terry and the Enchanted Makeover Committee at Make Mine Pink..thank you for being a part of the 2009 Vision Project. 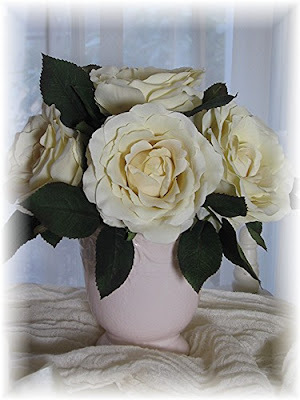 This Vanilla Rose arrangement in Pink Crackled pot has just been place under the tent at 20% off! Check it out HERE. Wouldn't it be nice to treat someone special this May Day with a little surprise flower bouquet? 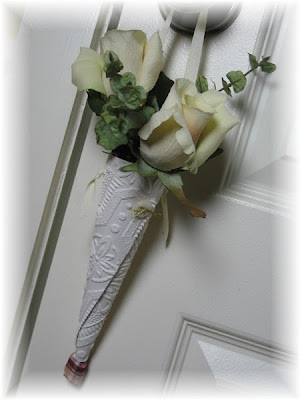 Traditionally, May Day Flower baskets were left on the doorsteps of neighbors on May 1st. 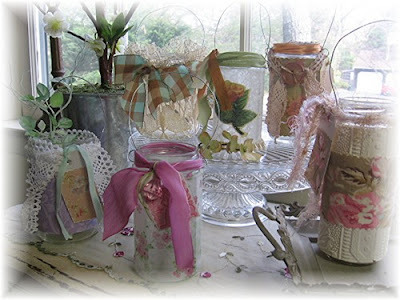 The jars are just an updated version of this sweet idea.We thought it would be fun to have a May Day Jar contest at Make Mine Pink. Click HERE for contest rules and info. Click HERE and HERE for a tutorial. This Vanilla Rose Tussie has just been moved to the TENT! I know it's over, but since we only finished making these goodies at midnight Saturday night, I didn't have time to share them with you. These are pics of the desserts we made for my brother and sister-in-law's Easter brunch. Not only were they fun to make and look at - they tasted pretty good too! 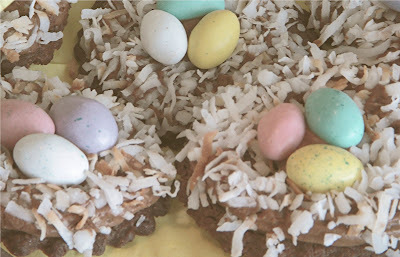 The little nests were a thin chocolate cookie with chocolate ganache piped on top and toasted coconut. We used peanut butter M&Ms for the eggs. It's a Martha Stewart recipe found HERE. The cookie pops were a basic sugar cookie recipe with royal icing. I used 10" sticks so that I could stick them into styrofoam set inside the planter. Aren't they cute?! We had a nice time at my brothers as usual, but I think I need to detox from all of the sugar we consumed yesterday! Hope you all had a great Easter! Pink Friday "For the Birds"
Spring is here, and you don’t even need to look outside your kitchen window or open your front door to know it. Just waking up to the sweet melody of a backyard robin cheerily singing outside your window is enough to tell you that life is renewed and spring is reborn. The birds of spring have returned and the earth reawakens. Outside, in our fenced yards and open fields, brightly colored bluebirds and streaked song sparrows flit between tree branches and land carefully among the budding leaves. Singing songs of love to each other, chirping madly over jealousies. Bringing home odds and ends to build their nests - bits of bright string, broken twigs. Items insignificant to everyone else, but the stuff of life for the feathered set. With the return of spring, we find our winged friends building homes in every unclaimed corner…. under the eaves of buildings, in riverbanks, on rocky ledges, suspended from tips of tree branches, hidden under flaps of loose bark. Even in the nest boxes we offer up with hope. Hanging baskets, mail boxes, old boots, flower pots. Any place that somehow looks like home. 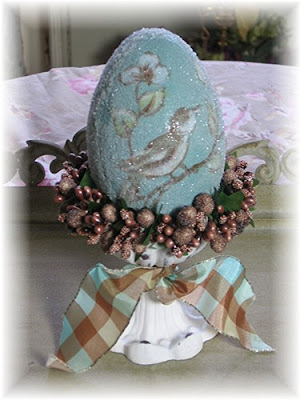 No matter where we live, or what the season, avian accessories create eternal springtime in our homes too. 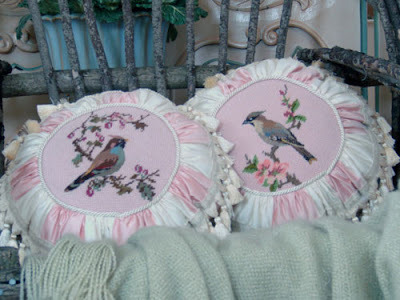 Birds and their nests placed carefully upon our shelves, painted delicately on a wall, stitched on a delicate needlepoint. Perhaps we invite into our homes the same birds we see each spring. Parrot green, robin’s egg blue, bright canary yellow, flamingo pink. A rainbow of color unfurls inside and out of our homes in the hopes of eternal spring. Click HERE to see what the boutiques at Make Mine Pink will be offering. Click HERE to see what I will be offering. Remember - products will be listed tomorrow. Just listed - under the TENT! May Day is on the Way! Last year I surprised some special friends with a little May Day flower surprise. I made these flower jars with supplies around the house and plan on making them again. Click HERE and HERE for the how-to from last year. Stay tuned - I have some more ideas for these cute little jars that I'm working on this week using fabric, canvas and burlap. I'm hoping to post them this weekend! 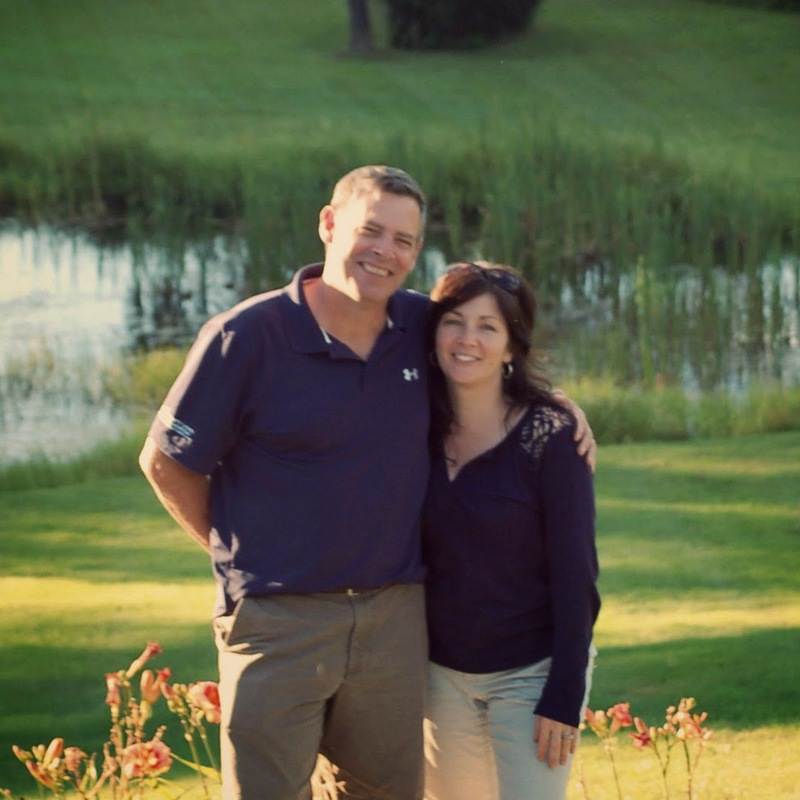 I am adding this to Melissa's Beautiful Life post at the Inspired Room. It's a great way to add a little beauty to someone's day! Click HERE to see what everyone else is doing this week. I am also participating in Julia's Hooked on Friday post because I'm hooked on making these special gifts. Click HERE to see what everyone else is hooked on! Marie Antoinette was young, tall, blonde and beautiful and she set fashion trends through France and Europe. She was nicknamed "Madame Deficit" or "Queen of Debt” because the Queen spent lavishly on her dress and adornments, exceeding annually her clothing allowance (her overruns always covered by her devoted husband Louis). Her flip remark “Let them eat cake” (attributed to her, but never confirmed) was the spark that ignited the French Revolution. Today, we simply cannot get enough of “Marie”Only 15 when she married the crown prince of France, the dauphin. France was then the most powerful nation of continental Europe, and the royal palace at Versailles the most opulent. She became Queen of France while still a teen. Her excessive fashions for high headdresses, plumes and voluminous dresses were subject to public comment, admiration and ridicule. At Versailles, the Queen also spent lavishly on her friends and on her entertainment. She held frequent gambling parties, masquerade balls and danced all night long.To escape the formalities, boredom, and royal obligations of court, Marie-Antoinette created a private realm of pleasure for herself and her friends at the Petit Trianon, a small retreat palace on the grounds of Versailles, and Hameau, where she planted the first Anglo-Chinese garden; collected all species of antique roses; and revolutionized architecture and gardening trends. It was so much her escape that the King was reported only to have visited her there a few times.So why do we love Marie Antoinette today? All her extravagance, her life of excess, her hairstyles that were larger than life, her reported love of pastries and champagne (some truth and some fiction as Marie was a teetotaler) all create for us a time and place where a young girl can be Queen. Marie Antoinette has become a real inspiration. Director of Community Relations @MakeMinePink. Visit the participating boutiques at Make Mine Pink - HERE. 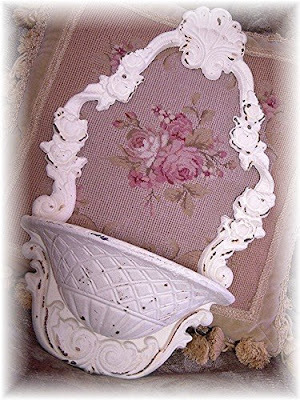 Visit my Marie Antoinette inspired products HERE. I know it's Wednesday and I should have posted this yesterday, but we were having computer issues. Sorry! I have a couple of these great candle holders left in stock. I just love the chippy iron holder and the crackled glass on these. See them HERE.